The 30-day workbook helps you uncover your purpose and put it in words. Everyday you get out of bed with a sense of purpose to improve lives and make the world better, but you haven't found the right words. It's as if the music is there, but you struggle to find the right lyrics. Finding Purpose is a simple and practical guide to help your clarify your purpose and find the right words to express it. If you're an entrepreneur, founder, or team leader who wants to inspire the people you work with to do great and meaningful work, Finding Purpose is created for you. The contents are based on methods and concepts that I’ve used to help brands and teams clarify their purpose. In thirty days you’ll get clarity about your passions and strengths, get a better understanding of who you serve and their needs, and find the words to express the true purpose of your work. Find the words and craft a purpose statement. Inspire your tribe by communicating what you stand for to your customers and people you work with. Finding Purpose Journal is a workbook in the form of a 30-day journal. Each day you are presented with a question exploring themes central to your work’s true purpose. The journal comes with an companion guide, which explains the key concepts that serve as the basis for the questions curated for the journal. Though the journal may seem simple, the sections and questions are based on a five step methodology that my team and I use with countless brands and teams. Uncovering purpose is like connecting dots. The journal is designed to help you surface those dots, connect them, and help you see your purpose clearly. Find your strengths: Clarify the skills and resources you have, and think through how your product is unique and how it benefits who you serve. Discover your passions: Reflect on why you’re doing what you’re doing. We explore you passions from your past to the dreams you’d want to realize. Understand your customers: Think deeply who is it that you serve. What needs and wants do they have and why do they have them? Identify key themes: Review your answers and find the themes central to your purpose. Express your purpose: You now see the dots. It’s time to connect them. The journal gives you a base template to get you started, but you’re free to spin off it and create a version you like. This PDF gives a quick overview on how to use the Journal and the Companion guide. You can preview the introduction for free here. The companion guide contains explanations of the key concepts, which serve as the basis for the questions in the journal. It’s a short, simple, and fun 27-page ebook with eight chapters. Each page was designed so they could be cut out and pasted to a 5.1 by 8.3 inch notebook such as a large Moleskine notebook. If you love Post-it Notes.. The lower area of each page are reserved for key ideas, themes, and takeaways you noticed in your entries. This area is designed to hold two small 2 by 2 inch Post-it Notes. In the second half of the journal, you’ll refer to these notes. If you do use Post-it Notes, you can transfer them to another piece of paper where you can see them all at once. How Is Finding Purpose Different? Before I created the Finding Purpose Journal, I created a course. It was a very comprehensive course loaded with info and worksheets. But not everyone made it to the finish line. How can I make this more approachable and more accessible? I took the lessons learned and I went back to the drawing board. The result is the Finding Purpose Journal. Compared to other books and workbooks, this guide is far more approachable and accessible. It boils down to this. 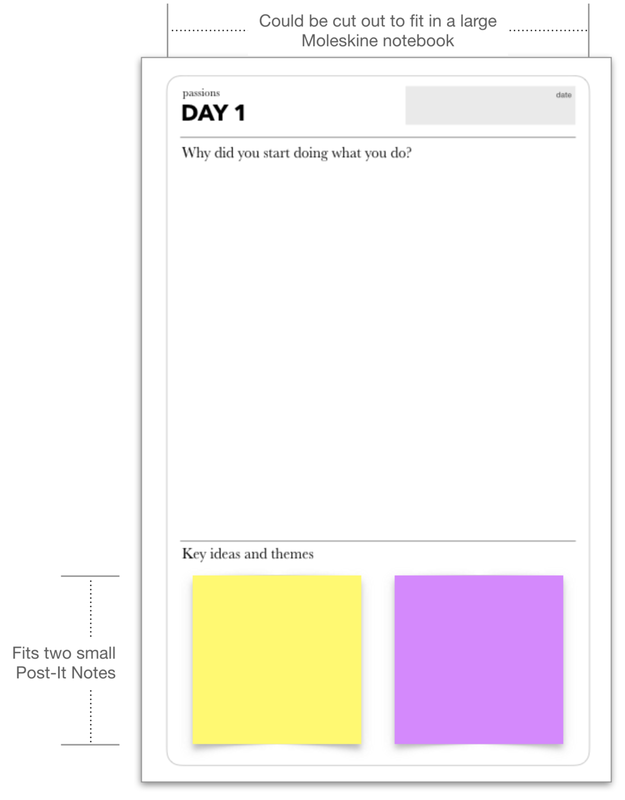 Finding Purpose Journal is simple, effective, and fun. Other books, guides, and workbooks come with required reading to get acquainted with the concepts. The Finding Purpose Journal has no learning curve. There are no required reading and videos. It does come with an optional Companion Guide, but feel free to dive right in. The biggest difference is Finding Purpose Journal is actually a workbook based-on proven concepts and methods disguised in a friendly journal. By journaling for just 15 to 20 minutes for 30 days, you will find and put your purpose in words. I’ve designed this to make sure you WILL get to the finish line. The optional Companion Guide is written in plain English and it is fun to read. It makes references to movies like Star Wars, Ratatouille, and more. In fact, the title of the journal, Finding Purpose, is a homage to a pretty well known Disney Pixar movie. Three reasons on why a clear purpose matters. 1. Communicate to your tribe what you stand for with absolute clarity. 2. Motivation to show up. What is your lifework's purpose? If you do not have a definitive and crystal-clear answer, then we are now at a cross road. The left is the same path where you continue on with a sense of purpose, but lacking the words to describe it in clarity to others. The right one is one that brings you absolute clarity to why you do what you do everyday. It is the path that lets you know exactly where your North Star is. Look up. And you’ll see it shining bright and clear illuminating the path forward. The Finding Purpose Journal is made by Justin Lee, a brand purpose consultant, workshop designer, and presentation producer. Justin has been helping brands, companies, and teams clarify their purpose and develop purpose-driven strategies for the past decade. He has worked at PricewaterhouseCoopers developing marketing strategies for companies around the world and in industries including automobile, aviation, consumer goods, startups, and digital contents. Previously he worked as a baker in Paris and Tokyo. He collects recipe books and currently lives in Tokyo and Los Angeles.